Sydney by Crown. The $250 million tower will be released for sale on November 22. 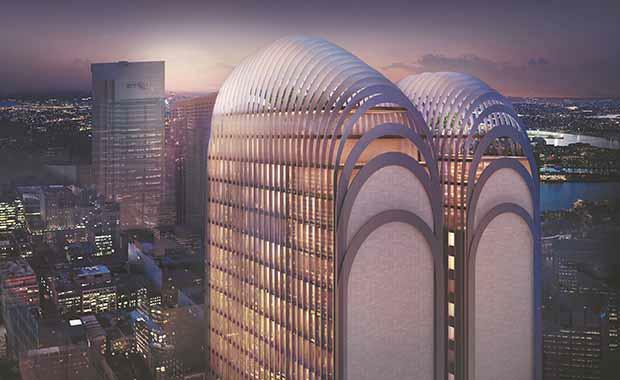 Sydney by Crown is set to be the only new apartment building in Sydney CBD to be launched before the end of this year. The 25-storey building, designed by internationally renowned Koichi Takada Architects, will feature heritage-inspired lower levels transitioning to a modern glass and steel tower, capped with dozens of steel arches. Lower levels will include an eight-storey cathedral-like atrium rising 20 metres above street level over a new public laneway between Kent and Clarence Streets, joining historic Skittle Lane. The tower is positioned within walking distance to Sydney’s new waterfront precinct at Barangaroo, new Sydney Convention and Exhibition Centre, Wynyard station and Darling Harbour. Construction is expected for completion in late 2017. Iwan Sunito, Crown Group CEO said Sydney by Crown would become one of Sydney’s architectural centrepieces and a globally recognised icon. Sydney by Crown will also be home to a collection of Crown Suites. “Sydney by Crown draws on Crown Group’s 18 years’ experience developing some of the most prestigious and award-winning projects in Sydney. We had clear vision to create a building to reflect the international, forward-thinking nature of Sydney,” Mr Sunito said. “Sydney by Crown has already proved popular in Australia and internationally and we anticipate a strong result this weekend,” he said. Crown Group was flooded with enquiries after Sydney by Crown registrations of interest opened earlier this year and now has received hundreds of expression of interest deposits ahead of this weekend’s launch. The property's spectacular rooftop will include water features, greenery and a rooftop bar open to residents and guests. Health and fitness facilities, including a pool and gymnasium, will be accessible at ground level. Crown Group has had a string of successful residential projects in Sydney since its establishment 18 years ago. Founded in Sydney in 1996, Crown Group has successfully completed major developments in Sydney’s best locations including Bondi, Bondi Junction, Parramatta, Ashfield, Epping, Homebush, Newington, Pennant Hills and Rhodes.